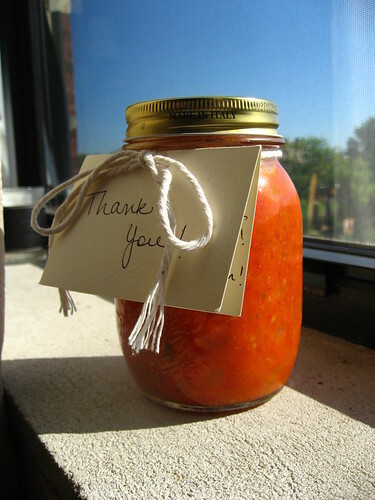 I’ve been spending a lot of time the past couple of months trying to find the right recipe for homemade tomato sauce. Up until a couple of years ago I was always a “sauce in a jar from the grocery store” person. I used to keep a standby jar of whatever sauce happened to be on sale in the fridge, waiting for the rare occasion when I would make some pasta (usually frozen ravioli). I know, I was incredibly classy 🙂 This was all, of course, before I started getting serious about cooking. Shortly after Kirk and I met, I soon found out that he is deeply serious about the quality of his favorite pizza ever: Chicago-style deep dish pizza. I think it was our second date when we drove down to Hyde Park and picked up Giordano’s take-out and brought it back to my apartment. It was so delicious. Giordano’s is always delicious – I’m predisposed to love it because the first time I had deep dish pizza five years ago it was from Giordano’s, and it was like a food awakening. All of that cheese… the chunky tomato sauce on top… the pastry-like crust… it was unlike anything I had ever had, in an “I can’t believe I’ve lived this long and never had this before” kind of way. As our relationship developed so did my pizza “aficionado” sensibilities. My first few attempts at making “my own” pizza involved Pillsbury pizza crusts (in the “pop” canisters), Hunts tomato sauce, and mozzarella cheese from a bag. I know – very inventive. Hey – at least I was moving past the idea that homemade pizza = frozen pizza. As the past two years have progressed, I have become increasingly adventurous. As a child I used to bake bread with my grandfather, so I generally knew what needed to happen in order to make a good loaf of bread. Therefore, I surmised, I should have the skill set to make my own pizza dough. Homemade breads are ALWAYS better than anything you can get from the grocery store, so the same should be true of pizza dough. I have experimented with a lot of different dough recipes (making small adjustments here and there), but those have not been completely “perfected” yet (though we are certainly close). Different types of dough are required for different types of pizza (deep dish versus Neapolitan versus flat and crispy, etc…), so finding the perfect set of dough recipes has been a challenge. In addition to an outstanding crust, the other most important element that adds to the quality of an excellent pizza is the sauce. This is the area where Kirk is holding me to the highest set of expectations. The quality of the sauce is really what can make or break a pizza. If the sauce is too moist, the bottom crust will turn out soggy, but if the sauce is too “dry”, you’ll miss out on feeling like you’re actually eating sauce. Additionally, if the sauce is too sweet you run the risk of having your pizza taste like something that came from a box in your freezer, but if the sauce is too bitter it’s going to distract from the warmth and richness of the cheese. As you can probably tell (and perhaps many of you know from experience) the subtlety of creating good tomato sauce is a difficult thing to master, especially when your main critic wants his pizza to taste even MORE amazing than anything you can get in Chicago. Producing excellent tomato sauce is no small task. So, having said all of this, after many months of experimenting (perhaps even bordering on a year?!?!?!) I think I may have hit on the tomato sauce recipe for me. I’m calling it the “Amazingly Delicious Tomato Sauce” (aka ADTS). I made it tonight and used it on two pizzas, but I could imagine this working as a great pasta sauce as well. At one point (while I was waiting for my pizza dough to rise) I actually ate a few spoon-fulls of sauce straight from the bowl. And, if I’m being completely honest,I feel like I could’ve eaten an entire bowl of sauce on its own (sans cheese and crust – oh my!). If there was ever a sign of a good sauce, that must be it (I’m a bread and cheese gal to the core). This is a sauce that is best created a couple of hours in advance of when you’ll need to use it. I know that there are some serious pizza people out there who firmly stand-by the fact that pizza sauce should not be precooked (and I LOVE many of those pizzas), but this is the method that I’ve found works best for me, and I’m pretty confident that if you give it a try you’ll like it too. 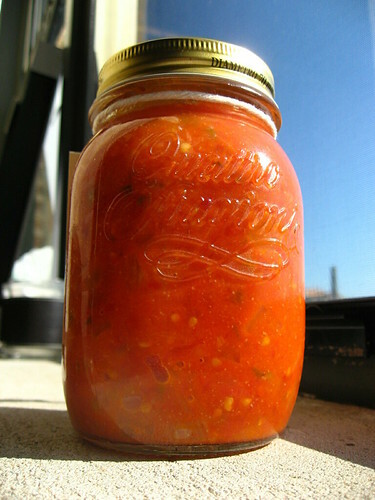 The breakthrough came when I was reading Molly Wizengerg’s blog (Orangette) and saw her recipe (now several years old) for tomato sauce. Really, it’s true that butter makes everything better. Pour the canned tomatoes (along with their juices) into a large saucepan set over medium heat. Using your hands or a large spoon, mash the tomatoes into bite sized pieces. Cut the onion in half and peel away the dried layers. Finely chop one half of the onion and mix it into the tomatoes. Keeping the other half intact, place it into the saucepan (you will want to cook the 2nd half of the onion to the point of having it release it’s juices into the sauce, but when the sauce is done cooking you will need to be able to remove and discard it). Mix the 5 tbsps of butter into the tomato/onion mixture. Cook the sauce, stirring occassionally, over medium heat for approximately 30-45 minutes, until some of the liquid has evaporated and the sauce has started to thicken. At this point the butter should be well incorporated. Remove the sauce from heat and remove and discard the complete onion half. Mix in the crushed red pepper, garlic, and oregano, and set the sauce aside. Let the sauce sit on the counter until it has cooled. Then (if you’re not using it immediately) place it in the fridge until it’s ready to use. Use the sauce for pizzas, or toss it while it’s warm with some pasta. I love you and your recipes, and will always pull the cart for you!